In the grand scheme of things, Trevor Bauer‘s performance in last night’s loss to the Toronto Blue Jays wasn’t terrible. 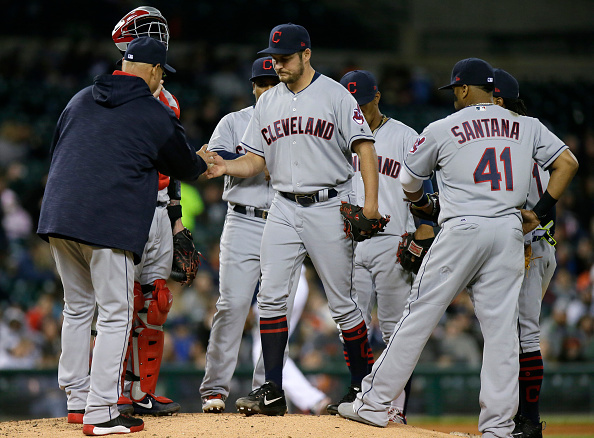 The mercurial Cleveland Indians starter allowed four earned runs in six innings pitched, notching six strikeouts and three walks. It was certainly better than the seven-run shellacking he received at the hands of the Detroit Tigers in his previous start. When you combine his showing from last night along with the rest of his appearances this season, though, it looks like more of the same. His ERA is now a hefty 7.36, and hasn’t been lower than 6.26 all year. Normally, the Indians wouldn’t have much of a choice besides just working with Bauer and trying to get him back on track. Making things interesting this time, however, is the presence of Mike Clevinger. Cleveland’s top pitching prospect is currently gunning for a spot in the big league rotation. His performance as of late, along with continued frustrations with Bauer are combining to set up a difficult decision on the horizon for the Indians. As mentioned previously, Bauer’s line from last night certainly doesn’t rank as one of his worst nights of the year. Still, in six games this season, Bauer has allowed less than four runs just one time. Complicating things is his continued lack of accountability. Even on his worst nights, Bauer always seems to have an excuse locked and ready. After the aforementioned seven-run showing against Detroit, he claimed he couldn’t be perfect all the time. Last night, he said all of his pitches were in the right location, and implied Toronto just seemed to get lucky. He feels as though he’s pitched well in most of his starts, and is just the victim of bad breaks. Essentially, 2017 has been everything you’ve come to expect from Bauer if you’ve followed him throughout his career. Cleveland has shown remarkable patience with him since he joined the club in 2013, and for good reason. Bauer does have tons of potential and more than a handful of pitches to work with. However, he refuses to accept both blame and critique. It forces you to wonder, though, how long the Indians can wait on potential. Adding more pressure on them is Clevinger’s performance so far this year. After mowing down any and all competition he faced in Triple A to start the season, he made his 2017 major league debut this past Sunday. In said game, Clevinger impressed with a five strikeout, one hit performance in 5.2 innings pitched against the Kansas City Royals. Thanks to ace Corey Kluber being placed on the DL with back pain, Clevinger is likely going to get another look this week. Should he put forth another solid day on the mound, the Tribe faces quite a decision once Kluber is healthy enough to return to the rotation. On one hand, Bauer clearly has what it takes to be a great pitcher, but his lack of consistency is glaring and continues to make him a liability. On the other, a couple more quality starts from Clevinger will force the front office to determine whether or not more time in the minors would be a waste for him. Though Bauer is out of options, a move to the bullpen isn’t out of the question. The team took the same route to open the year last season. Smart money says Clevinger will be sent back down, with Cleveland once again showing a willingness to let Bauer try and work out his issues. That said, how patient will the team be if this is indeed what happens? At the moment, Clevinger sure looks ready to be in a big league rotation. Likewise, the story on Bauer remains unchanged – a talented pitcher who’s far too susceptible to overthink everything, including reasons for his struggles. While the team can quiet the conversation for the time being, another quality start from Clevinger followed by a token on-mound implosion from Bauer is only going to increase the demands for change.